About/Contact Us - 1687, Inc.
1687, Inc. was organized by a group of artists and business people in 1994 to access resources for live and recorded performances by Lenore Von Stein and Company. The changes in our work, for example our current concentration on mass media in conjunction with refining our exploration of ideas/themes and expanding our palette, e.g. use of multiple disciplines and media demonstrate 1687’s ability to evolve to meet artistic and logistical needs. In our first two years of operations, 1994-1996 we presented a core free jazz trio. From 1996 - 2003 we added group shows tied together by a theme, often with a political perspective. These group shows also expanded our pool of musicians and composers, and included those working primarily in modern art music, western opera, classical, electronic, and blue grass music. We also used chance elements, visual artists and more detailed themes. Starting with a post 9/11 series of concerts, The Festival of Secrets for the Victims of Violence 2001, we added conversations between scholars. From 2003 - 2008 we focused on developing new performance pieces and techniques using a core ensemble of players from a range of musical disciplines. Improvised elements were used as bridges between composed elements and to increase the immediacy, vibrancy of the music. Composed music was used to feed the ears of the improvisers and to anchor the entire evening. Stories were used to help the audience accept the modern music – to endow it with relevance in terms of every day reference points. During this period 1687 became a creative laboratory independent of a performance schedule. In 2009 we began development of a series of art music and discussion programs for cable TV and web The Facts. Since late 2010 half-hour episodes of The Facts have been broadcast Thursday evenings in New York City on three cable networks and also distributed on the web. The music is both composed and improvised and played by an ensemble of classical and jazz musicians. This expressive music is interlaced with stories. The purpose of the 1687 Board of Directors is to provide the support the staff needs to achieve the organization’s goals, for example fostering/maintaining financial transparency, and democratic staff grievance processes. This support also includes relieving the artists of marketing and fundraising concerns in order to remove these as barriers to creative thinking, challenging insights, and the creation of new expressive forms. Marc Mannheimer Visual Artist, Professor of Art, Northern Essex Community College, MA. 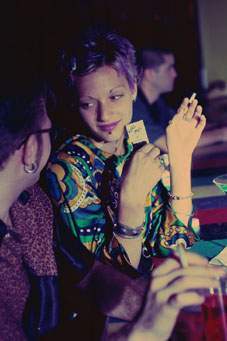 Lenore Von Stein has worked with be-bop, free jazz, classical, and electronic musicians and composers and uses techniques from these musical disciplines as well as methods and approaches developed in classical and modern theatre. Von Stein’s works are made of improvised and composed music and stories. They have also included visual art, dance, and scholarly discourse. Von Stein began her artistic work as an actor/playwright doing non-musical scripted and improvised live performances and films before shifting her focus to the performance and composition of music. Von Stein’s non-musical theater credits include originating the role in Samuel Beckett's one-person piece The Expelled. Her work in music has followed a similar pattern of developing from performer to composer/performer. Von Stein’s works examine the structure of reality and ideas and are presented in live and/or recorded performances. Each performance is unique in terms of its particular slant and/or story, and some or all of the music. Lenore calls them “living paintings” because each performance is a complete drawing that is, in part, created in performance. In 2009, 1687’s core group of musicians and a TV crew began taping a series of half-hour TV programs “The Facts” for Manhattan Neighborhood Network (MNN), NYC. The Facts presents these “living painting” once a month on MNN. Andrew Bolotowsky co-directed the Criterion Series at the Guggenheim Museum and has recorded for Orion Recordings, Golden Age Records, Opus I, and Station Hill Records. He has performed with the Pan American, Westchester Philharmonic, and Brooklyn Philharmonic orchestras and has worked with Downtown Music Productions, Music Downtown, the American Festival of Microtonal Music, Muse (Colonial American Music), the Delbarton Baroque Ensemble, and New Amsterdam Baroque. Maximilian Avery Clark has lived his life under a dual credo of “Do right by your fellow man,” and “Always observe proper oral hygiene.” A 2008 graduate of Western Michigan University's Political Science and English departments, Max was the grand prize winner of its Creative Writing Awards in 2008. Since graduation, he has lived in New York working as a High School English teacher, a business consultant, instructional writer, political satirist, grant writer, stand up comedian and juggling instructor. He has enjoyed several New York productions of his one act plays and his short fiction and commentary has appeared in a number of publications on three continents. Pedro Florentin is a freelance technical director currently working with Telemundo 47, MSNBC Fox News. Pedro received a BA in Television and Radio Production with a minor in Business Law from Brooklyn College, CUNY. Daniel Garriga is a photographer, editor, and filmmaker. Daniel received a BA in film from Brooklyn College and has worked as a production photographer, camera operator, and editor on TV and film projects and is currently supervising post production for a production services house in New York City. Beth Griffith has appeared with Sequentia, Musikfabrik, Ensemble13, L’Art pour L’Art, Cologne Radio Symphony Orchestra, and the Paris Nouvel Orchestra Philharmonique and has worked with composers John Cage, Morton Feldman, Mauricio Kagel and Karlheinz Stockhausen. Her one-hour, solo recording of Feldman’s “Three Voices” was awarded the German Record Critics Prize. Daniela Muhling is a flautist, translator (German/English), photographer and filmmaker. Stills from her film Concrete are used on the 1687 TV series, The Facts. Bern Nix held one of the two guitar seats (from 1975 to 1987) in the original edition(s) of Ornette Coleman's band Prime Time. Nix's album as leader "Alarms and Excursions" on New World Records features Fred Hopkins and Newman Baker. Birgit Pellenkoft is freelance designer/stylist from the Netherlands now living in New York. Birgit has designed print matter, web sites, and wedding décor as well as sets for a commercial on Dutch TV. Jacqueline Sotomayor, lives in Jersey City, NJ, and is a female photographer born into Latin family in Jersey, raised in the New Jersey/ New York City area. She is interested in completing a "Motorcycle Diary" style photo essay documenting the political and social landscapes of ever changing Latin America. In New York she uses photography to give voice and lend awareness to communities that remain "invisible" to society. Jacqueline is a student of ICP and freelance cinematographer in independent films. I’m a 2008 S.U.N.Y Oswego Graduate with a B.A in Broadcasting and Mass Communication. I’m a Brooklyn native with a love for entertainment and media. I have a passion for the creation of film and its compelling ability to direct a story. I have developed a myriad of skills to nurture my fascination with studio, post and field productions. A few of my areas of expertise include: development of documentaries, short videos, short films, post production, camera and etc. I was former post production intern for Gold Glass Productions/ Be Media, LLC. on a feature-length documentary film “Outside the box” by Lacey A. Schwartz to be release soon. On spare time I enjoy playing and watching football (soccer) and baseball, supporting Chelsea Football Club and The New York Yankees." Alan Feigenberg has been a practicing architect for over 40 years and a teacher-facilitator for over 35 years. Alan, as a colleague of Mario Salvadori helped initiate work and programs in New York City public schools through the Salvadori Center using the urban environment a source for integrated learning. Through their work they have reached thousands of teachers and students brining an excitement about our urban environments and all that it holds for us to explore and learn from. Alan is a professor of architecture at the City College of New York having taught design studio, construction technology, freshmen introductory seminars on “the Architecture of New York City,” and an award winning elective “Teaching Architecture.” Alan is also an affiliate professor of environmental psychology at the City University of New York graduate center having developed and co-taught electives in “Food and Architecture; the Relationship Between Ethnicity, Class and Restaurant Design,” and “the City as Museum,” brining together students in architecture, urban design, landscape architecture, and doctoral students in education, environmental psychology, urban sociology and food management. There are a number of ways to contribute: from donating money, to equipment, to your skills and time. 1687, Inc. is a tax-exempt, non-profit organization funded entirely through individual donations and grants from foundations. We receive no corporate underwriting. Without your support, we couldn’t grow. Our 2011 fundraising goal is $25,000 – our current budget is a little over $13,000. Increased funding will allow us to cover some of our overhead costs, pay stipends to our staff (core band, TV crew and office staff), distribute our work, and manufacture and distribute “Provoked by the Clown,” an audio work about the value of art to the audience, in this case Heinrich Boll’s novel “The Clown.” This process is chronicled on our Arts and Business Log. 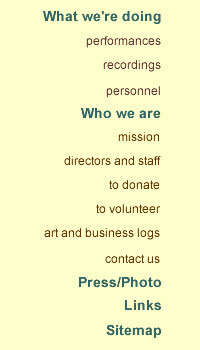 1687, Inc. is a 501(c)3 non-profit organization. You can make a tax-deductible donation online using PayPal through a secure server. Volunteer either at our studio/office or from your home. We are in constant need of help with our administrative, outreach, and even production efforts – current volunteer needs are described on this page. Would you like friends to donate to 1687, Inc. in lieu of receiving gifts for a special occasion? Ask friends and family to donate to 1687, Inc. using our on-line donation page and write into the comments field who the gift is in honor of when they check out. We will keep track of your personal donor list and thank them on your behalf. You might consider leaving assets to 1687, Inc. in your will. If so, let us know. Ask YOUR TV STATIONS today to add The Facts to their schedules. Project Description: We are developing a marketing team for a web-based distribution and marketing of The Facts. This distribution/marketing project provides an unusual opportunity to help market an expressively complex TV shows that reach as well as provide information about making TV shows that may be useful to other people interested in utilizing public access TV. We are looking for three volunteers to help for us: develop and implement web distribution and marketing strategies, increase website visibility and traffic. Marketing specialist(s) to help us develop and implement web marketing strategies and work plans targeting the diverse range of constituencies for the whole series and/or for specific episodes. Required hours: 3-4 hours per week from your locale. All positions are non-paying with the possibility of becoming paid depending on funding. College credit may be available to current students depending on your school’s internship credit policy.